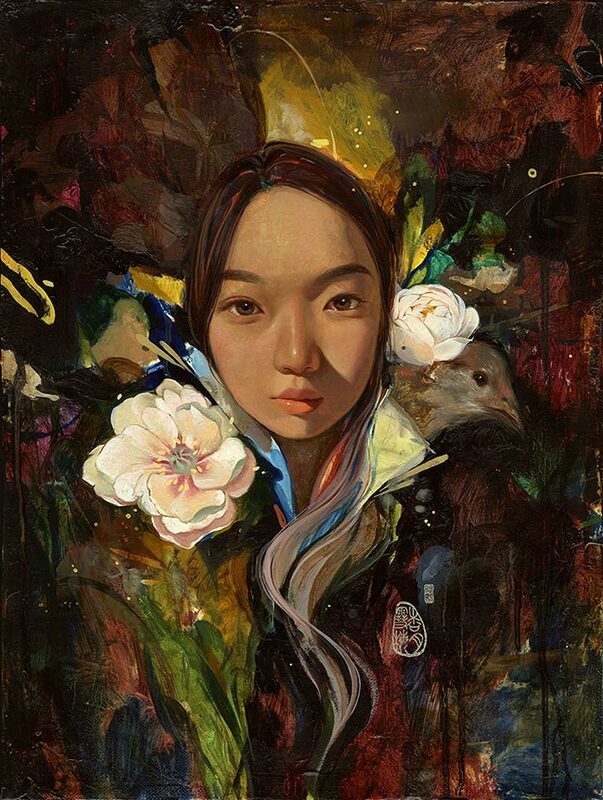 The figurative paintings of Soey Milk combine the raw power and confidence of her bold brushwork with the profound intimacy she infuses into the rendering of her stunning protagonists. 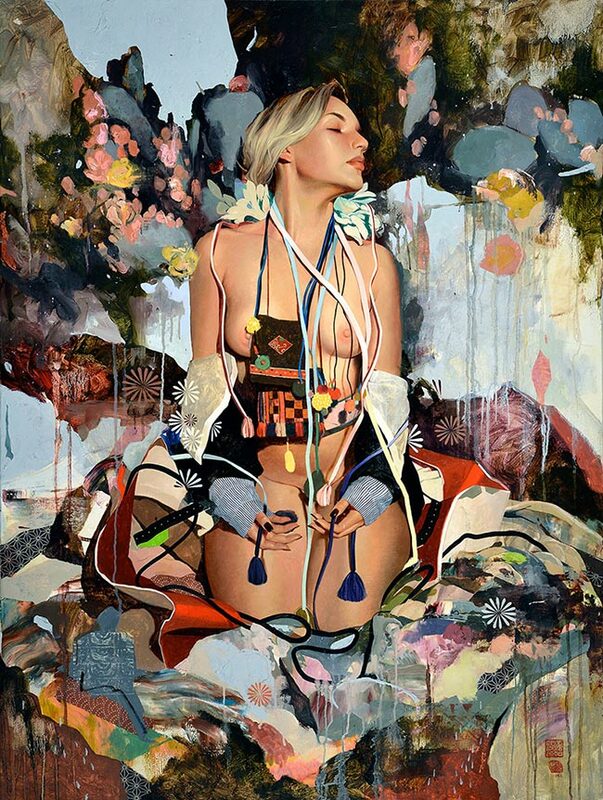 A master at making opposites sing together in harmony, Milk interweaves realism with abstraction, innocence with maturity, sweetness with devilishness, to create beautifully intelligent imagery, offering multi-layered dimensions of not only an aesthetic nature, but on an emotional level also. Her often large-scale works serve as a means for Milk to process meaningful life events, discoveries and emotions, and upon each works completion, her library of mark making becomes a library of thoughts and feelings, a diary if you will, only one which has the ability to speak to us in ways where mere words would fall short. 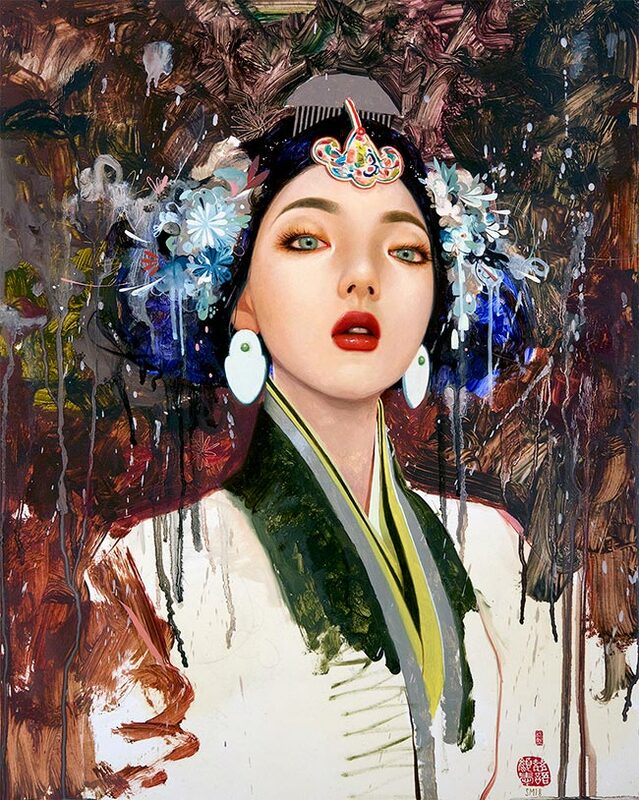 Soey Milk was born in 1989 in Seoul, Korea and moved to Southern California in the year 2000. 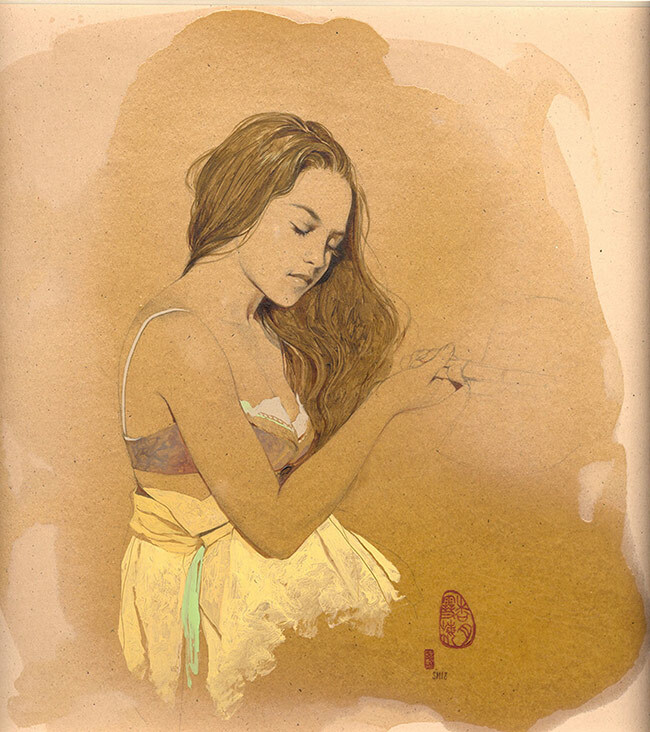 At first, Milk’s path was leading her to become a ballerina but after she was first introduced to painting she decided to pursue the artistic career. 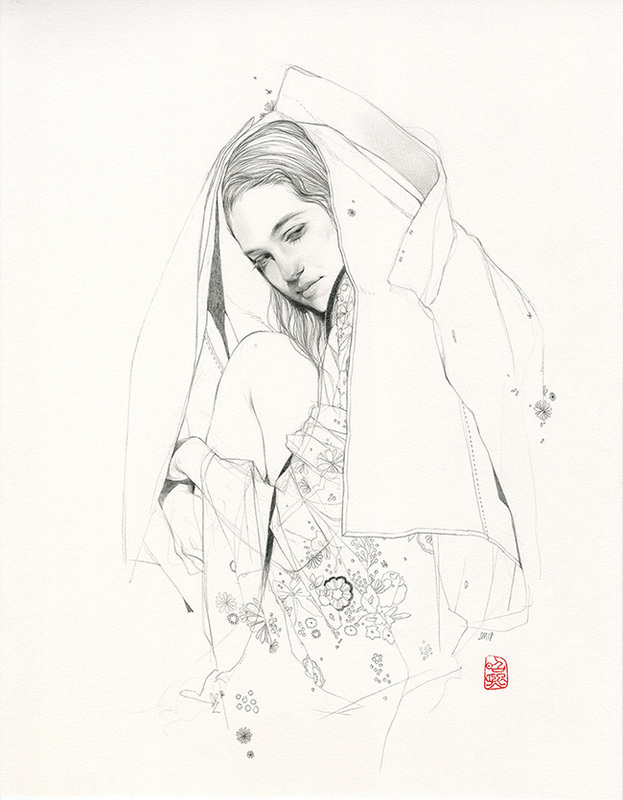 A graduate of Art Center in Pasadena, CA, Milk has carefully developed her inimitable style over the years, becoming appreciated and collected internationally. 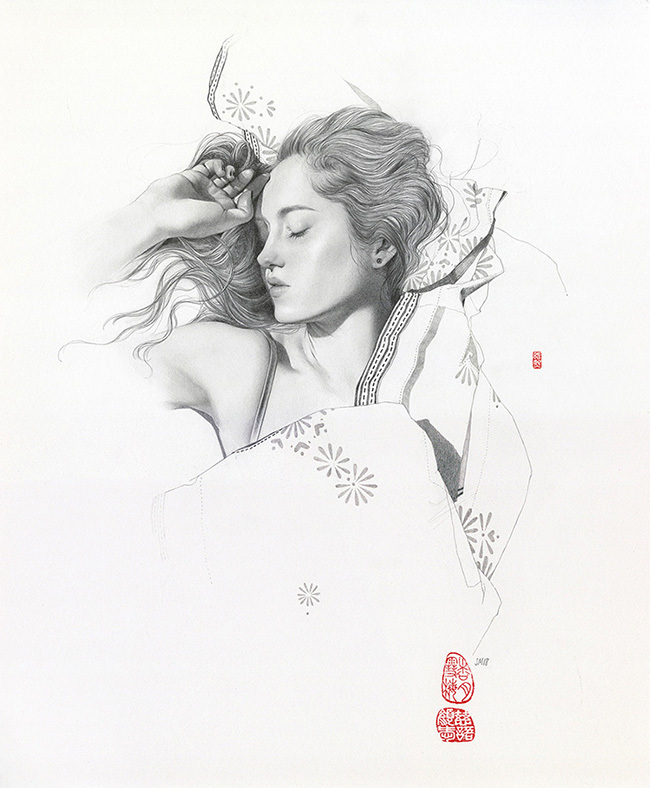 WOW x WOW had the very great honour of catching up with Soey on the eve of the unveiling of ‘Inflorescence’, her second solo show at Corey Helford Gallery which opened on this past Saturday, 8th September and runs until 13th October. 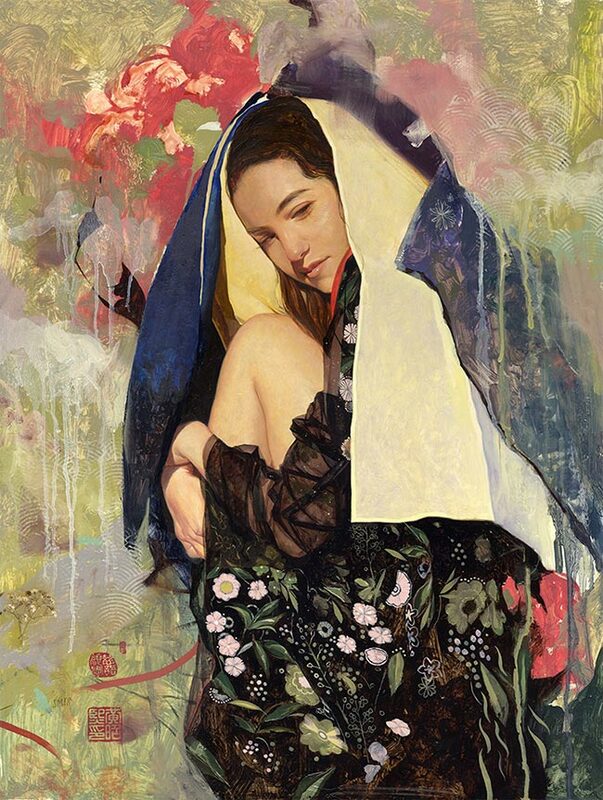 We hope that you enjoy learning more about Soey and her wonderful new work in the following exclusive interview. 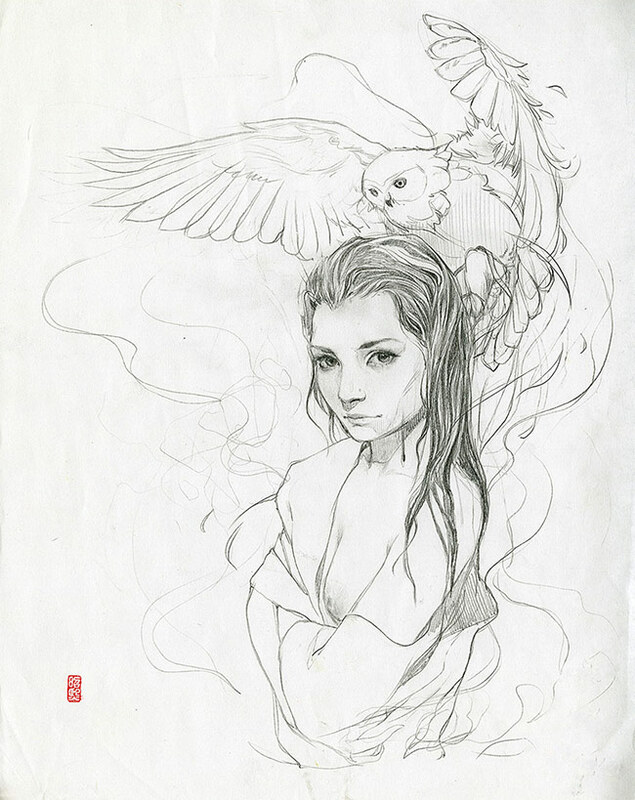 Hey Soey! It’s such an honour to have you join us for a little chat! 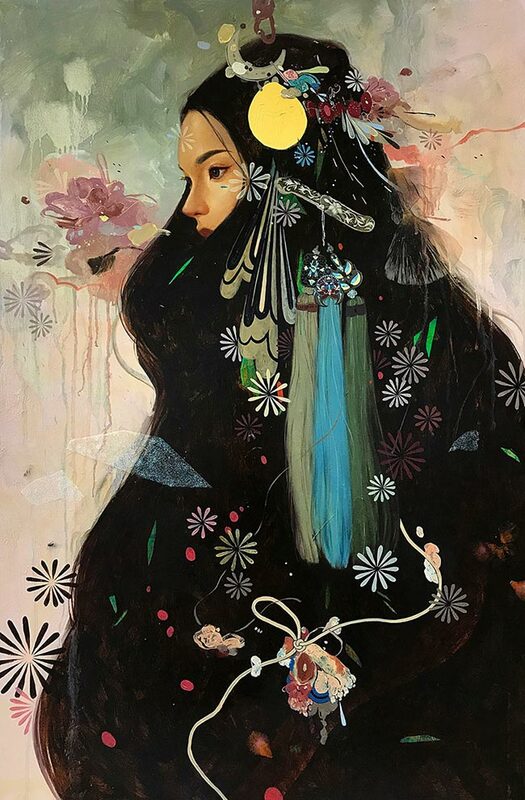 Let’s start off by talking about the event which has brought us together, the exciting unveiling of ‘Inflorescence’, your brand-new solo exhibit at the wonderful Corey Helford Gallery in LA. Firstly, we’d love to hear a little about how your relationship with Corey Helford began. I was still in school when I started working with the gallery. I was frequenting galleries and coming to openings whenever I could, and I really liked the liveliness of Corey Helford Gallery. Jan was always so sweet and cordial, and her passion for the arts was always obvious. After participating in a few group shows, she asked me to join the family. And I have been ever since. 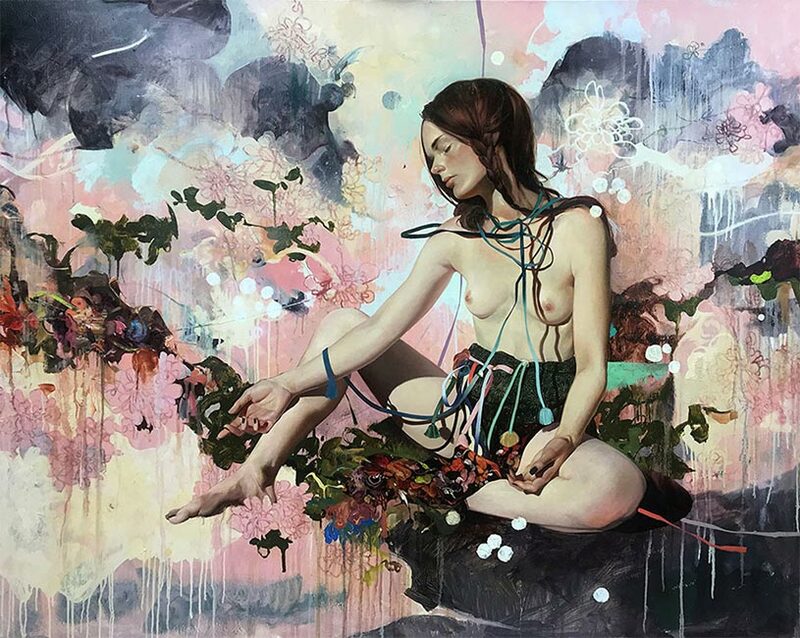 As is the case with the majority of your artwork, the inspiration for ‘Inflorescence’ revolves heavily around personal events in your own life. To quote the press release for the show, the artworks are unfurling as chapters from the floral axis of your life. We’d love for you to expand on this idea of a ‘floral axis’, and also give a little insight into the most significant life events that you drew upon during the making of the work. The idea of a floral axis that I’ve talked about is directly translatable to a timeline. And this timeline is made up of different logging of experiences, like writing a diary. But image-making for me often takes a lot longer than a daily journal, it’s like writing one huge entry for many, many days. Even for months. 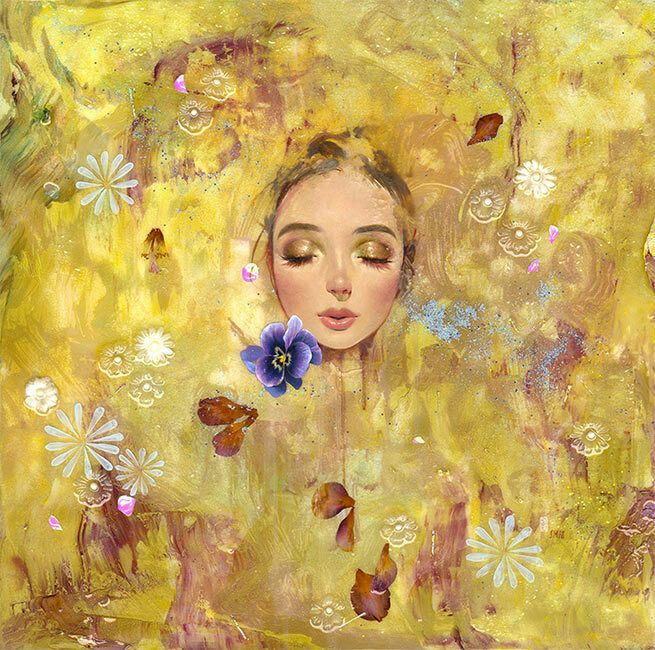 One painting for me could encompass whole chapters in my life, like the death of a pet or a newly developing interest. Your new work also sees your continued experimentation with incorporating found materials and embedding objects in your paintings. Talk to us about what led to your first explorations of this technique, how far you think you’ll push it, and in what ways you feel your work benefits from its inclusion. I think the embedding started with me feeling a little bit frustrated with painting. I was looking for a different way to create an image. I’m outside in my backyard frequently working in the garden because I feel that it’s good for my body and mind. One time when I was thinking about the limits of the rules of painting, I became aware of how much dirt was lying around and I thought, “You know what? This is exactly what I need.” Because the piece that I was working on at that time was about how quiet my gratefulness had become, how my life has everything I need, and yet I seem to appreciate nothing. So, I just spontaneously added some of that dirt to the painting—being very literal with the addition of it, because we all go back to it. My interest right now is somehow incorporating bird feathers because I have so many of them from my pet chickens. As mentioned above, with my work being big diary entries pinned to my timeline, I feel that these incorporations of wide range of materials sharply mark the work’s place in time. 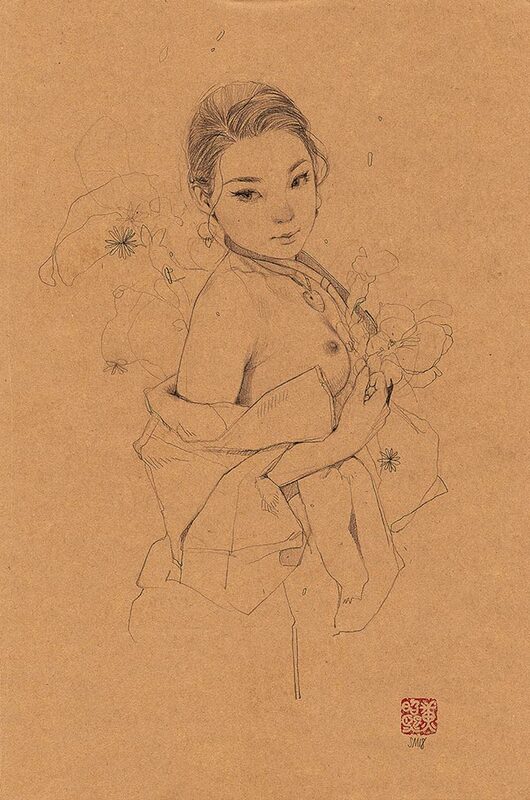 Drawing is such a vital component of your practice and in ‘Inflorescence’ you’ve decided to showcase some preliminary sketches for some of your best-known works. What wonders can we expect to see and what lies behind your decision to include these in the exhibition? The little seed drawings! I’m very excited about showing these because no one’s ever really seen them. I don’t throw anything away, so I’ve always had them with me. For this show, for the first time ever, I will be premiering painted pieces along with their carbon transfers and also the seedling drawings for ideas I had. The relationship between the small drawings and final paintings are, in my opinion, similar to growth of a seed into a tree. That’s the part of the reason why the show is titled “Inflorescence”. Sharing these drawings is about showing the initial ideas for my paintings, back when it was a doodle on a receipt, or on an envelope I found handy. I think it’s enjoyable to see the growth from sketch to drawing, and painting. Before moving to Southern California in 2000, you spent a good number of your informative years in your home country of South Korea. What aspects of your heritage and the South Korean culture do you still find yourself ruminating on or reminiscing about most frequently, and how do they inform your creative thought process? I’m interested in color. On traditional architectures of Korea there is an ornamental painted pattern called ‘danchung’ that keeps wood from rotting. It is a beautiful organization of bright and bold colors, and I’m in awe of the graceful arrangement of the explosion of hues. That’s one of the biggest factors I try to pull into my pieces. Who or what has had the most influential impact on your development as a person, and in turn, as a creative? In what ways has this influence both changed and remained constant over the years? 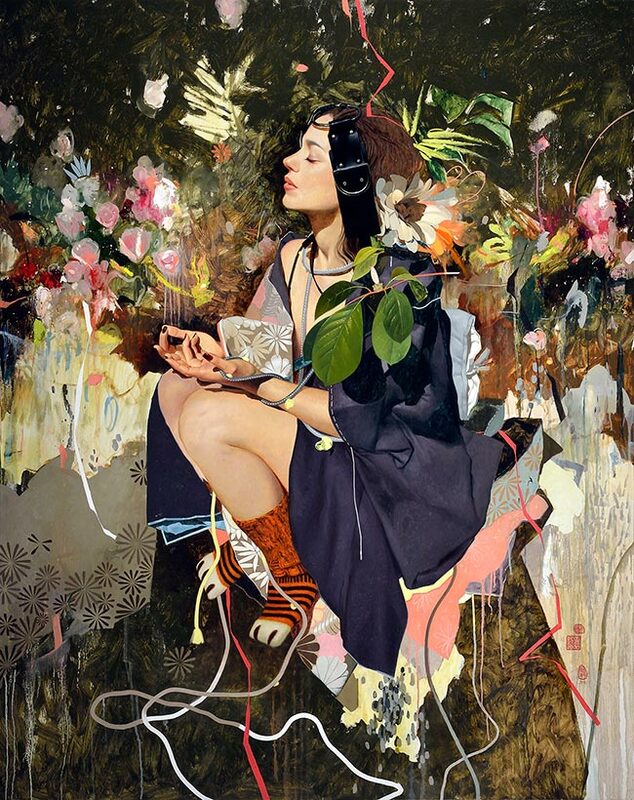 Kent (Williams) is my partner, he’s helped me tremendously to grow as a human being. 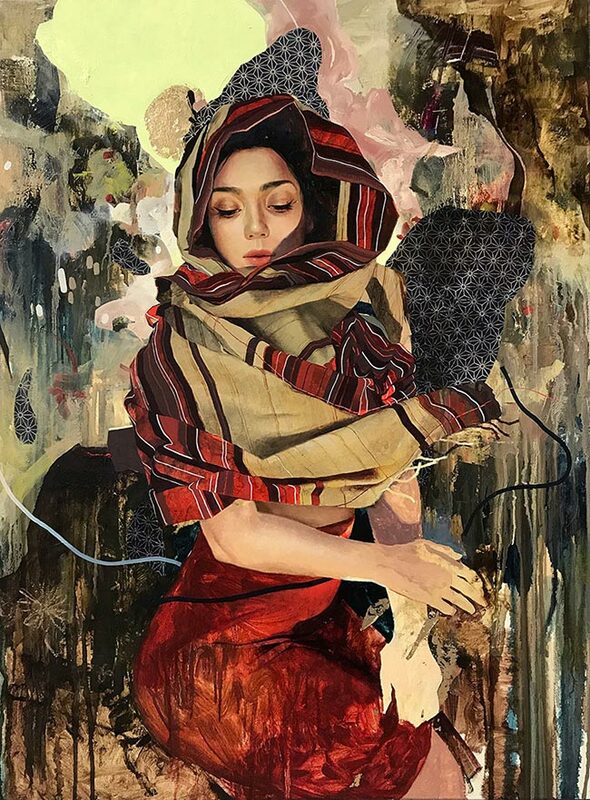 I think us both being painters recognize the struggles that an artist goes through, but for me, he has inspired me outside of artist’s boundaries. I learned through him the power of saying, “I love you. I appreciate you.” I grew up in a strict setting. My dad’s side of the family always told me to ‘be a girl, be a woman’. I remember as a child watching a movie where a girl visited her grandmother, and as soon as the front door opened they gave each other huge hugs and kisses on cheeks. I remember that being really foreign to me. In the beginning of my relationship with Kent, I told him that my family felt very distant to me and I had no idea how to bring us together. I clearly remember him saying, “No one’s going to know that you love them unless you tell them. Go on and tell them.” And that was a huge breakthrough for me. It gave me relationships I’ve never had, it completely changed my attitude towards life. This doesn’t really count as a memory I look to for inspiration, but it was a huge shift for me when I realized no one has been as cruel to me as I have been to myself. I have always been my biggest enemy. Recognizing that then focusing on turning my thoughts around from those toxic patterns has been huge for me. I try to be as aware of the present as much as possible, but do think that it’s important to always mind and appreciate the past. My favorite is Gustav Klimt. 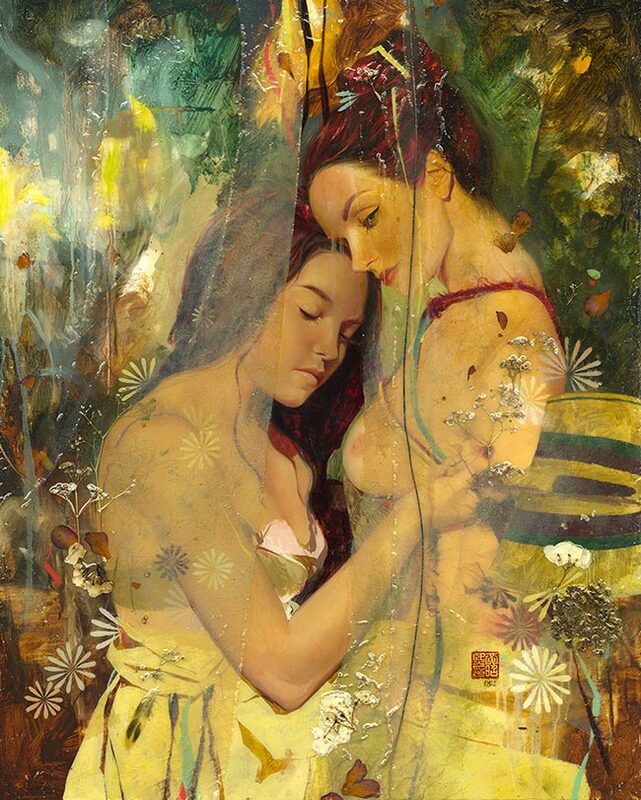 I admire the freshness and the simplicities of his work, that were acquired by years and years of work. The way his hand melted into every piece, that’s how I want to be. Inspired, I wish to create work through this ‘human filter’ that I have. Klimt’s ‘The Virgins’. 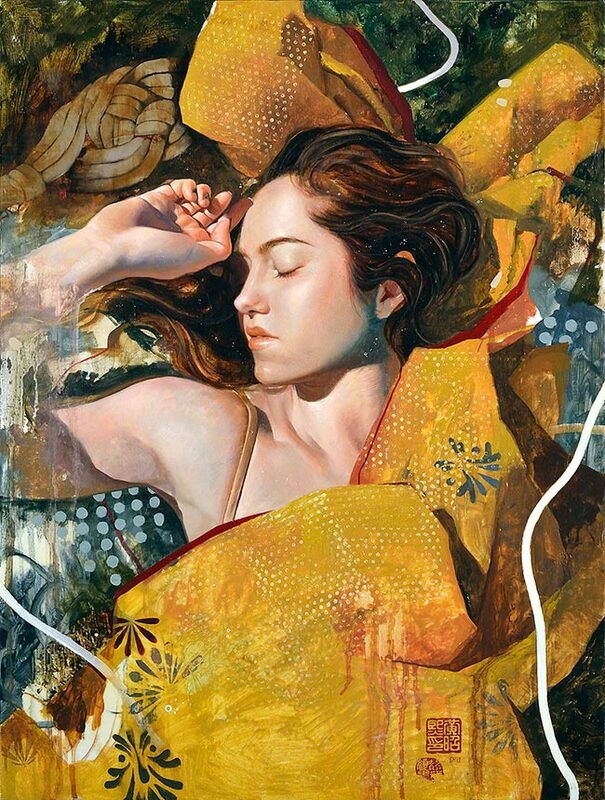 The most gorgeous painting in whole world to me. 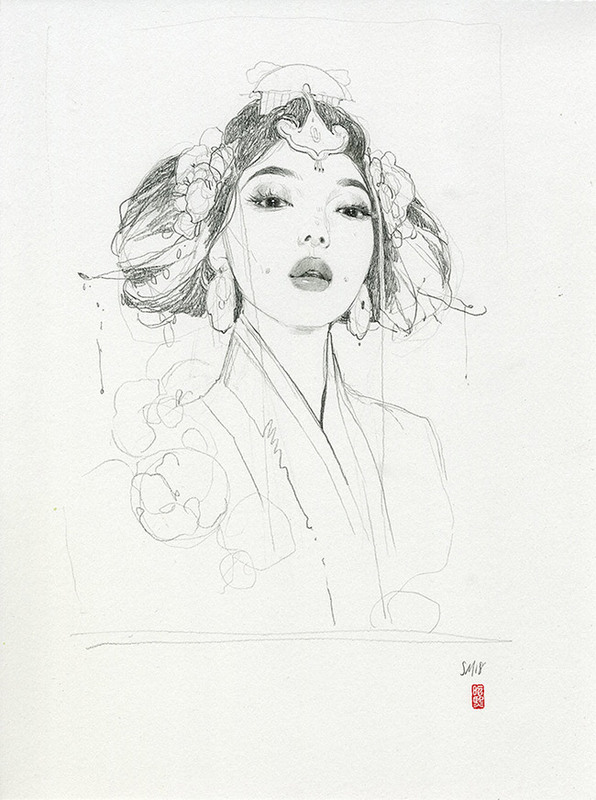 What’s next for Soey Milk? What’s next for me is to create while I travel. I’ve only been a studio painter because I’ve found what’s comfortable. Recently I have started falling in love with off grid camping. I would like to try working while travelling because as an emotionally charged person, I think if I’m in the middle of nowhere where I am away and alone, it will naturally give me a different approach to the way I think and feel and create. And I don’t know how yet, but all of that will affect the way my work translates onto the canvas. It’s time to see what ‘paint-on-the-go’ may lead to.